The Bruce Peninsula is one of Ontario's natural beauties and with the level of access we have to parks, lakefront locations and venues that makes it a great place to take wedding photos. There are places to shoot pictures all up the shoreline including Wiarton, Big Bay, Spirit Rock Conservation Area, Tobermory, Cyprus Lake, Half Moon Bay, and several parks and piers along the way. Dunks Bay, Lion's Head and Dyers Bay are some of those places where we've taken pictures in the past. If you're interested in finding a unique natural lake front wedding photo location let us know and we can arrange a custom destination and schedule for your photos at some of our secret spots. We would love to show you around. 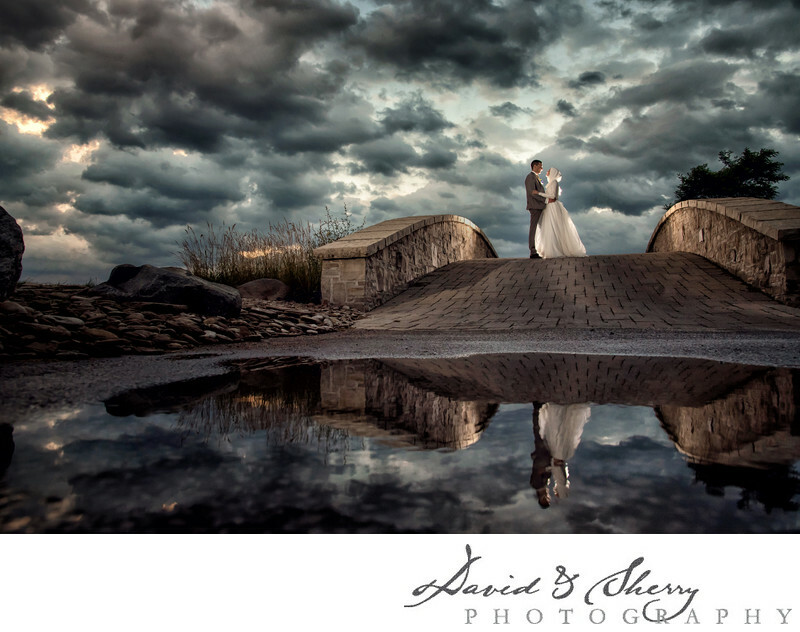 This particular photo was taken at the beautiful Cobble Beach resort in Kemble Ontario using the recently fallen water that pooled at the base of the famous stone bridge as a reflection during sunset. You can have a look through our portfolio to see all manor of images from ones we've taken along the Niagara escarpment, in fields, open spaces, canola fields, and many other ideas we have used through the years to create memorable and unique Bruce Peninsula wedding photos.